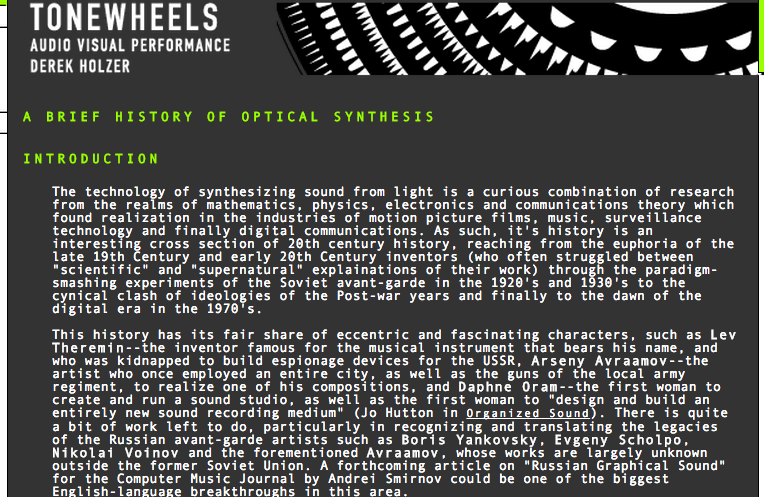 The online article "A Brief History of Optical Synthesis" was written by Derek Holzer in 2007 as part of his Tonewheels project exploring optical sound and colour music. 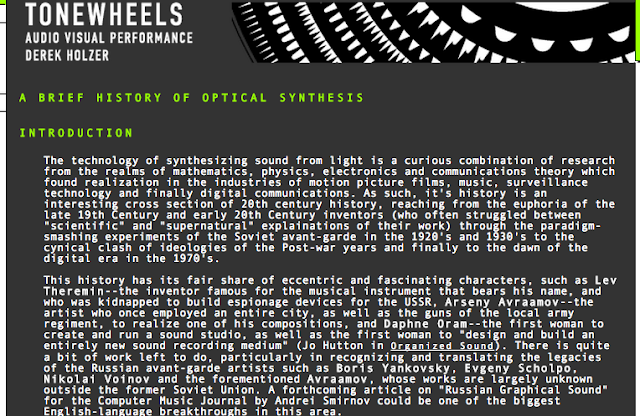 This web article became the basis of a lecture that Derek gives on optical sound and graphical composition. "The technology of synthesizing sound from light is a curious combination of research from the realms of mathematics, physics, electronics and communications theory which found realization in the industries of motion picture films, music, surveillance technology and finally digital communications. As such, it's history is an interesting cross section of 20th century history, reaching from the euphoria of the late 19th Century and early 20th Century inventors (who often struggled between "scientific" and "supernatural" explainations of their work) through the paradigm-smashing experiments of the Soviet avant-garde in the 1920's and 1930's to the cynical clash of ideologies of the Post-war years and finally to the dawn of the digital era in the 1970's. "